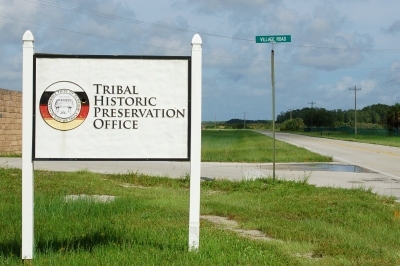 The Seminole Tribe of Florida’s Tribal Historic Preservation Office (THPO) was established on July 15, 2002 by the Tribal Council through Tribal Council Resolution C-185-02. On October 8, 2006, through provisions of Section 101(d) (2) of the National Historic Preservation Act, Tribal Council signed a Memorandum of Agreement with the National Park Service (NPS), implementing a Historic Preservation Plan. The duties of the State Historic Preservation Officer were officially shifted to the Tribe’s Tribal Historic Preservation Officer. Tribal lands, as defined by the NPS, are “all lands within the exterior boundaries of any Indian reservation and all dependent Indian communities” (16 U.S.C. 470w). The responsibilities of the THPO under the National Historic Preservation Act and 36 CFR sect. 800.2 stipulate that through consultation with federal agencies, the THPO has direct supervision over cultural resources on tribal lands. As such, the THPO staff is responsible for preserving the archaeological, historic, and cultural sites of significance to the Seminole Tribe. In 2013, the Tribal Council unanimously passed the Seminole Tribe of Florida Cultural Resource Ordinance (C-02-14). Enactment of the Ordinance will serve to improve long term planning and development, preservation of the Tribe's cultural heritage, and the protection of cultural resources and historic property both on and off the reservations. In order to better meet the needs of the Seminole Tribe of Florida, the THPO is organized into four sections (Archaeometry, Collections, Compliance Review, and Tribal Archaeology) under the direct supervision of the Tribal Historic Preservation Officer. Visit our THPO Section page to find out more!